First, a re-cap. NIHITO – which stands for Nothing Important Happens In The Office – is the process in which people who design products or services for customers go out to meet them, ask them questions and determine exactly what sorts of problems those customers have. 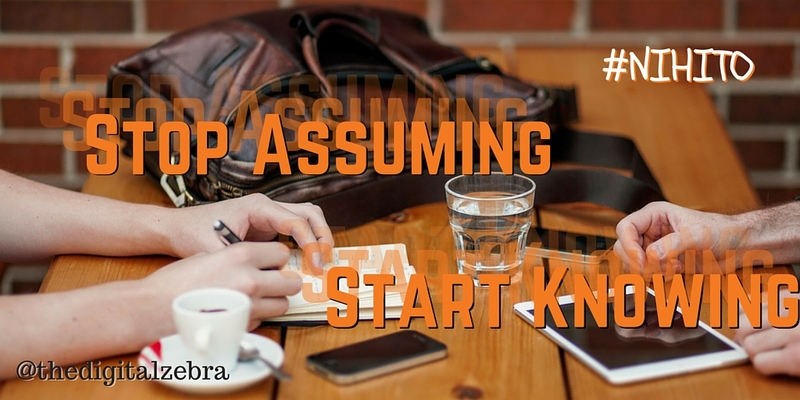 First, understand why you are adopting the process. Adopt the mindset that the best thing we can do is to design products and solutions around what we know are our customers’ problems. Instead of “the best thing we can do is to design something we think customers will like, then tell them how great it is“. Stop assuming. Because thinking you know what customers want is wrong. It’s likely to end up with a product designed to meet what you think the customer wants, not what the customer actually needs. Start knowing. Start using the word “because”, eg we have designed this product in this way, because our customers tell us that’s how they need it; or we know the product is right because 77% of our customer base indicated they would pay for us to provide this solution. Second, have several NIHITO meetings. Set aside time with the only people who truly know what your customers’ day to day problems are: your customers. Talk to them about the problems they face. And don’t get distracted. Listen to them. Very, very carefully. Third, solve their problems, with a unique solution. Pool your customers’ problems. If necessary, prioritise them, by importance, urgency, ease of fixing, value, or whatever method suits best. Decide which ones you can fix profitably. Design your solutions around them. Finally, tell them you have solved their problem. Promote your solution. But ensure it talks to the problem you have solved, not how great the product is. Keep promoting your solution. Because, so long as it’s still solving customers’ problems, customers need to know about it. Listen out for new problems. Because when customers tell you their problems have changed, you need to start the process again, not just continue to sell old solutions. So, how should you run the meetings? A NIHITO meeting is a face-to-face, two-way discussion, enabling your customer to explain what problems she faces, day-to-day, in her job. It’s a means of extracting an in-depth view of the problems that the customer has, without presenting solutions. So, don’t sell; don’t present; don’t rush. Ask questions, listen and don’t steer. Distinguish between meeting customers and having NIHITO meetings. Don’t try to fool yourself that every customer meeting is a NIHITO meeting. They are completely distinct. A NIHITO meeting is purely for the purpose of finding out what problems your customer experiences regularly. It’s not about setting up the next meeting. It’s not about selling something. It’s not about chasing up invoices, reviewing orders or completing deals. A NIHITO meeting works only when the sole purpose of that meeting is to investigate that customer’s problems. Make plenty of time. How long do you normally set aside for a meeting with a customer? An hour? 90 minutes? For a NIHITO meeting, you have to be prepared to make much more time. You can’t rush to the end because you have a lunch; or just try to squeeze in one more meeting between two others. Devote half a day in your diary. Even if you tell your customer the meeting will likely only last half an hour. If they want to carry on and tell you more and more of the problems they have, make sure you let them. Switch off, but concentrate. It seems obvious, but make sure you switch off all distractions during the meeting. So no calls. No texts, no Skype, no WhatsApp. Don’t look at Facebook or Twitter or LinkedIn. Nothing should distract you from the meeting. But don’t switch off completely: concentrate. Offer your customer the respect of your complete attention for the whole meeting. Only then will they feel comfortable enough to be able to share their most important, most trivial-sounding, or most “ridiculous” problems. Listen. There is a saying in the sales industry: “you have two ears and one mouth, use them in that proportion”. This does not hold true in NIHITO meetings. You must listen much, much more than that. You’re not telling the customer anything; you’re not selling the customer anything; you’re inviting them to off-load their problems. So listen. Attentively. Ask the right question; over and over again. The question you need to ask is: “…and then what do you do..?” – and you need to keep asking it until your customer has explained in detail how they typically overcome whatever problem it is that they are articulating. Only when you have learned exactly how they get round their problems can you determine whether you’re able to fix those problems – and fix them profitably. Armed with a detailed understanding of customers’ problems, you can design solutions – products, services, processes – that profitably fix those problems. You will end up with commercial offers that fit perfectly what your customers want. 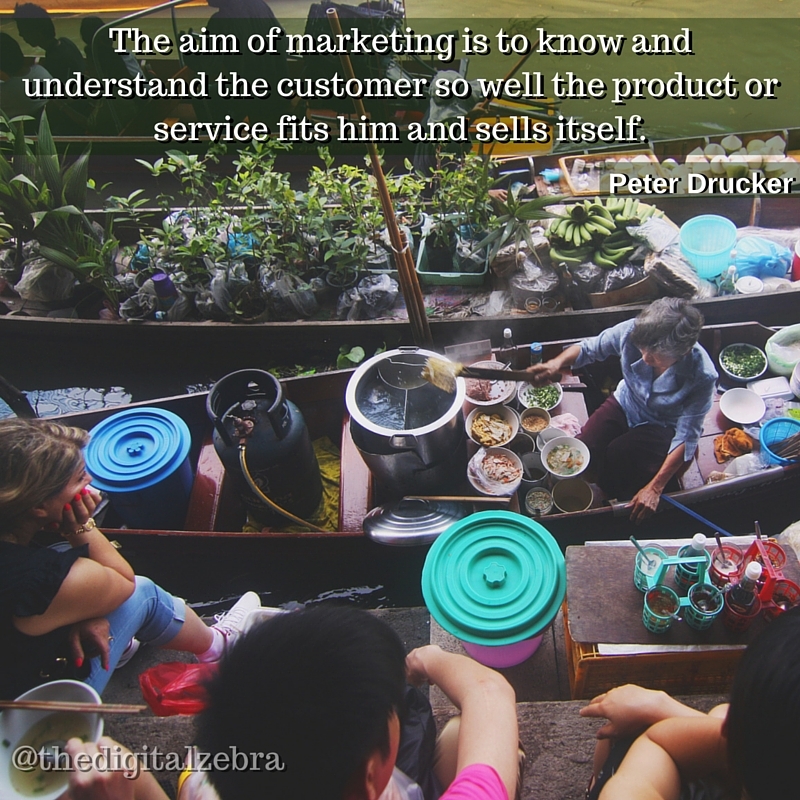 Get the product right and, as Peter Drucker states, you will understand the customer so well the product or service fits him and sells itself. In the next of this series of articles on NIHITO, we will look at real-life examples of how it has been put into practice. NIHITO is a Trade Mark of Pragmatic Marketing Inc., of Scottsdale Arizona. Do you need to gather more market information? Do you have full knowledge of what your customers think of your products? And do you know what your customers’ top problems are – and how you can create products that will fix them? Contact us today – we can help you gather the right information from your customers, so you can create the best possible products for tomorrow. Email us now – info@thedigitalzebra.com.